Throw measures 48" x 48"
Ah, so we see that your kid has been busy. Does he or she need a little break from being the friendly neighborhood Spider-Man? Yeah, we totally get it! It's tough work being a superhero, so we don't think it's a bad idea for them to take at least one night off. Our recommendation? Put some Netflix on, and relax on the couch! 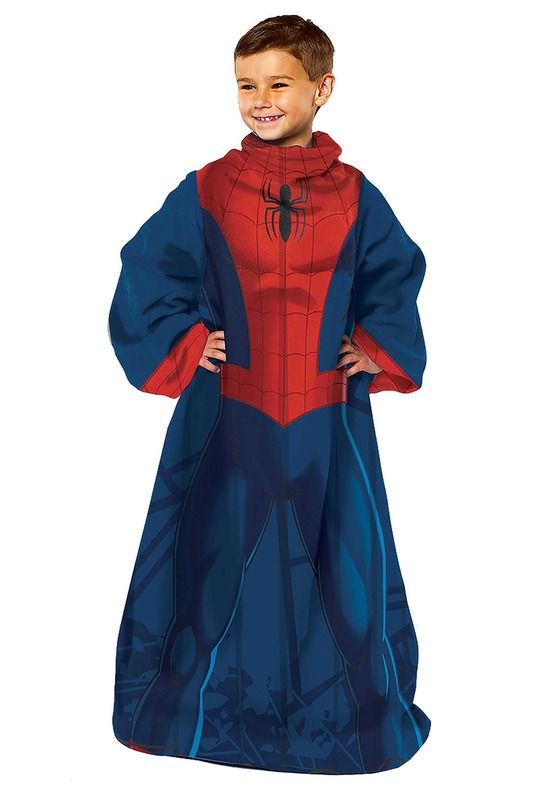 Of course, just because they're not out saving the day means they have to abandon their cool Spider-Man style, so they can relax just like the real Spidey when they snuggle up in this Spider-Man Child Comfy Throw. Marvel Comics officially licensed, this Comfy Throw is a blanket with sleeves for an awesome amount of comfort. It's made of super soft 100% polyester fleece, and it's printed with Spider-Man costume details. It measures about 48" by 48". We love our costumes, but we think costume apparel and accessories are pretty great, too. So, that's why we're proud to carry items like this Spider-Man Comfy Throw. Whether it's for Halloween, dress-up day at school, or just for good old-fashioned fun around the home, we've got it covered. Check out our entire selection for more Spider-Man fun!